I love Thai food, although I’ve only been to Phuket once and have not set foot on Bangkok yet. Somehow I cannot resist a good bowl of piping hot tomyam or fragrant pieces of pandan chicken or rich mango pulut desserts. Therefore I am constantly searching for good Thai food in Penang. And my most recent haunt for amazing Thai food is Chok Dee Thai located at Burmah Road. This restaurant used to be located in Island Glades but has now moved to one of the shoplots along Burmah Road (after Holiday Travel and Tours, next to Klinik Tropika, just before Jalan Loh Boon Siew) It is located nearer the Padang Victoria end of Burmah Road. I must admit though that the first time I dined here, I wasn’t really impressed. Possibly because we didn’t order their signature dishes or my tastes buds were just off that day. Luckily though I came back a second time and have been a fan ever since. Chok Dee Thai offers various types of tomyam including this clear tom yam which I adore. Sour and spicy all rolled into one hot bowl of yummy goodness! Their Thai otak-otak is also a winner as the fish fillets are fresh. 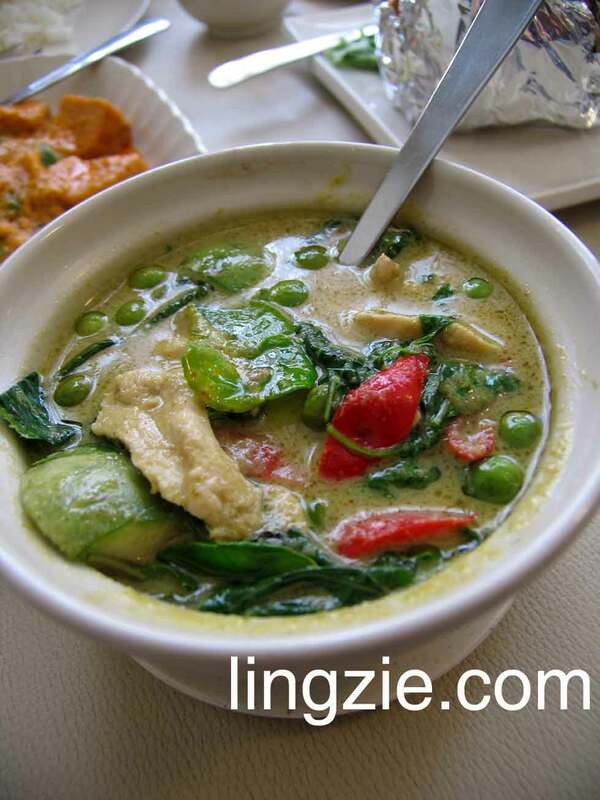 Another favourite dish of mine here is the green curry chicken. They sometimes have it cooked with beef instead but not always. Either way, the green curry is very good! Generous use of fresh basils and herbs lend great flavor to this rich slightly spicy curry. The long beans with pork (siew bak) is also a another dish that agrees very well with us. The long beans are stir fried with slices of salty pork (siew bak). A must try! On one of our visits, we spotted another table ordering the tau fu (beancurd) curry paste and it looked intereting to me since I love beancurd. So I ordered it on my next visit. While it was good, some might find it rather normal. Their Thai Style Long Beans is something rather unique too. Cooked in a very addictive sauce which is rich and creamy (thus I think coconut milk is used). What I love about this place is that the portions are not too big (for the small size) so you can order more dishes to try. Plus the generous use of fresh herbs in their dishes really makes their food very flavourful. The owner tells us that he travels to Thailand weekly to stock up on herbs and spices which is perhaps why most people who dine here say that it tastes very authentic. 28 Comments Comments For This Post I'd Love to Hear Yours! Fei Fei favourite outlet too…. Before they moved back to Penang, Burmah Road, they were in Auto World, Juru Auto City. Too bad, the biz wasn’t good, I think that’s the reason why they moved back to Penang. One of their signature dish is deep fried kailan, that’s good! both of us were honoured to be able to taste the food here. Sunny like the Otak-otak and keep mentioning it in the car as we were driving back to KL that nite, lol! I like the the roasted pork stir fry with long beans, lovely and awesome, something different from other thai places Thanks Lingzie for buying us lunch on that day! cool! What a great glimpse of Penang! We will be back this december! My first time eating tau suan was in this place a month ago. The lady owner recommended it to us. It goes well with the thick santan. BBO – glad you both enjoyed the food. was a lil worried about taking you guys there…cos you all KL lang should have lots of good thai food there right? hehe see you guys in december! What a coincidence … I am posting an intensive Thai food review also …. The clear soup tom yam which you ordered is commonly known as TOM SOM in Thailand. I had these type a lot when I was there for business trip. gina – hehehehe now i look at my post i also feel like going to thai food! hahaha. how so slim la like this?? I went to Chok Dee Thai once, and that’s it. If you really love Thai food like me, you can try this place at 6A,Abu Siti Lane @ MAA ROY. They have the OG flavor of Thailand. p/s : must order the SECRET PORK! princess – hi there! thanks for the tip! i’ve passed by Maa Roy a few times but havent gone in. now must go and try the secret pork! I will put it on my list, overall prices are ok? We used to visit this restaurant when it was located in Island Glades. After they had shifted, we had lost track of their location. Glad that I found its new location at your blog. Tks! durianberry – looks like we have similar tastes! i do prefer the green curry with beef as well! but sadly they don’t make a lot of it here so it runs out pretty quickly. christy – overall prices are ok – mid range. not really expensive but not cheap either. lk – hi there! hope you’ll like the food here at their new location too! I am staying in Island Glades, how come I didn’t know they where there all the while? For the dessert I love Thap Thim Krop it is very refreshing and very delicious. Should dine 1 one day. Thank you very much for your insight into my parents restaurant. Please do not hesitate in giving suggestions or ideas. We are always looking to re-evaluate the establishment and strive for improvements. I do apologize if the service is sometimes not up to par, but it is extremely difficult finding able help. Both my parents are very friendly and approachable people so please feel free to let them know if your tom yum isn’t spicy or sour enough or anything that needs some alterations to your taste. Yes my parents do the marketing themselves on their off days in Thailand to source the best ingredients. That’s the secret to any good cooking! We’ve been in Island Glades(behind Genting coffee shop)for six years then moved to Auto World when our contract expired. For about a year, my parents grew weary traveling the long distance when they lived at the other end of the island so it only made sense to move back to the island, much to the delight of our regulars. We’re very thankful for your support and promise to continue serving our best. authentic and nice thai food but a bit pricey though! I went there for my first time with my family and cousin from KL. Let me describe our first unpleasing visit to Chok Dee Thai. First of all, the parking was super lousy, it is not convenient for customers at all. We were trying to park in front of the restaurant and we have to shift our car so many times due to there were other customers trying to get in and out. After what seems to be a long time battling with the traffics, we finally managed to park our car and enter the restaurant where we asked the lady at the counter for our booked table. She said she already gave our table to other customers as we were late for more than 10 minutes. Imagine our disappointment! They did not even have the courtesy to call and inform us about it (I don’t know what’s the use of taking down our phone number during booking?). Then we told her, we had spent a lot of time making way for other customers’ cars in the parking lot where she replied; you should have come in and inform us first. Although that might seemed to be the logical thing to do, I do not like the attitude at all. Worse of all, she even blame us for it, saying it is our fault. So much for the service. hi sc, so sorry to hear abt your unpleasant experience with chok dee! there is simply no excuse for bad service and they should have called before giving away your table! SC, maybe I’m just guessing here but was this during the CNY festivities? Yes, you are absolutely right about the parking, its horrendous, then again, we aren’t situated in a bungalow or mall with ample parking, though at night there is sufficient parking around the vicinity, even at the nearby Oh Eye Clinic. I sincerely do not think you were ten minutes late, maybe a little longer because we usually hold booked tables for about 15 minutes before letting it go and that is usually when we are fully booked, otherwise we would give a courtesy call to confirm your arrival. If you did come late and state the manoeuvering of your vehicle took the extra time, I suggest you alight first and make your way in for your table. If you perceive yourself to be running late for whatever reason, give us a CALL. Most of our customers let us know they will need some time for example clearing the Penang Bridge over to our location to which we duly take note and always oblige. We hope if you do change your mind and come back, you will have a more pleasant experience next visit. Lingzie, you are right. Hope they will improve on it and be better. Good service tends to be over-looked nowadays.